The island country of Malta, which became a cryptocurrency and blockchain hub in 2018, topped the list of countries with virtual currency exchanges ranked by their trade volume. Malta’s rise to the top was largely due to Binance, currently second on the chart in terms of adjusted volume, which shifted its base in the second half of 2018. 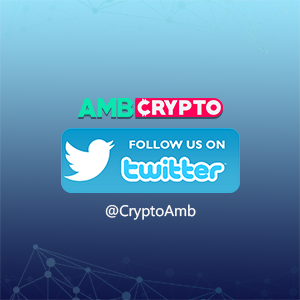 A report by CryptoCompare, studied several exchanges and their trading volume between December 2018 to February 2019. 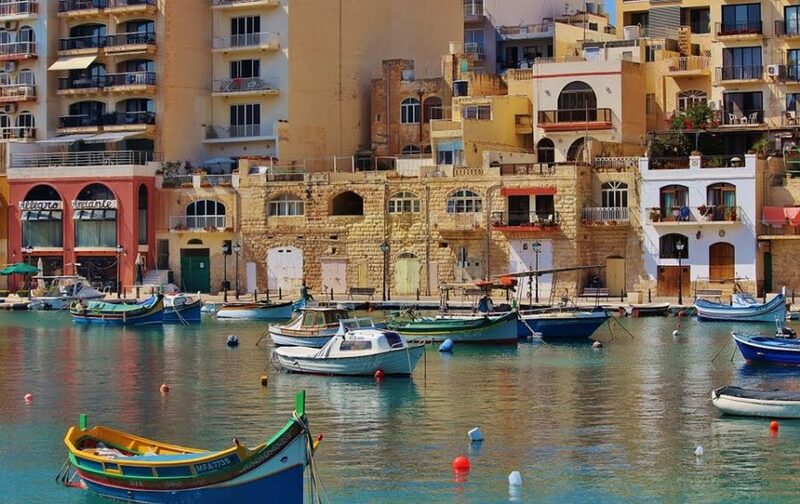 Malta is home to two of the top 5 exchanges, Binance and OKEx, accounting for $18.95 billion and $16.83 billion of the total monthly trade volume. Following Malta on the list were other crypto-havens like Hong Kong, South Korea, Samoa, Seychelles, Vanuatu, and Singapore. Other notable exchanges in the top-10 were ZB and ZBG headquartered in Samoa, LBank and HitBTC based out of Hong Kong, CoinBene, from Vanuatu, IDAX from Mongolia, among others. In terms of fiat-to-crypto exchanges, South Korea took the top two spots, with Bithumb and Upbit bringing in $26.81 billion and $5.72 billion monthly volume. Other notable exchanges were Bitfinex, Kraken, Coinbase, Bitstamp, and BitBank. The country-wise analysis further pointed to an increase in the monthly-trade volume by 8 percent since January for Malta alone. In the same period, Hong Kong and South Korean exchanges saw a bump of 12 percent and 6 percent, respectively. 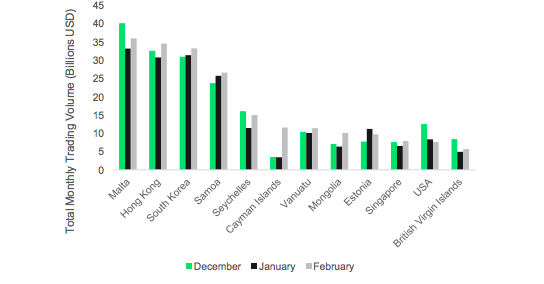 In February, the trade volume between the three top countries was within a few billion of each other. Mata recorded $35.9 billion, Hong Kong $34.5 billion, and South Korea $33.2 billion in trade volume. The CryptoCompare report also details a case of lopsided trade size with the number of trades deeming the activity “suspicious”. The report cited the case of LBank, which recorded a low number of trades (around 4,000) and a higher average trade size ($16,400). This revelation came days after a report from The Tie stated that several cryptocurrency exchanges faked their trade volumes. On studying the web views to arrive at the expected volume and comparing it to the reported volume, The Tie found that several exchanges recorded trade volumes lower than 1 percent of what was reported. BitMAX, LBank, BW, and ZBG, were the culprits, according to the report. The study, which looked at 100 exchanges, stated that exchanges like KuCoin Coinbase Pro, Gemini, BitBank, Bitstamp, Kraken, and Coinone all recorded trading volumes under their calculations as the metric employed showed a value of over 100 percent. Binance and OKEx recoded values of 78.82 percent and 5.94 percent respectively. Several cryptocurrency proponents were left enraged by the findings of this report. Changpeng Zhao, the CEO of Binance, stated that reporting inflated trading volumes is “destroying credibility with pro users”. The mainstream adoption of cryptocurrencies and blockchain technology has come a long way, with many financial and non-financial institutions now entering the mix. 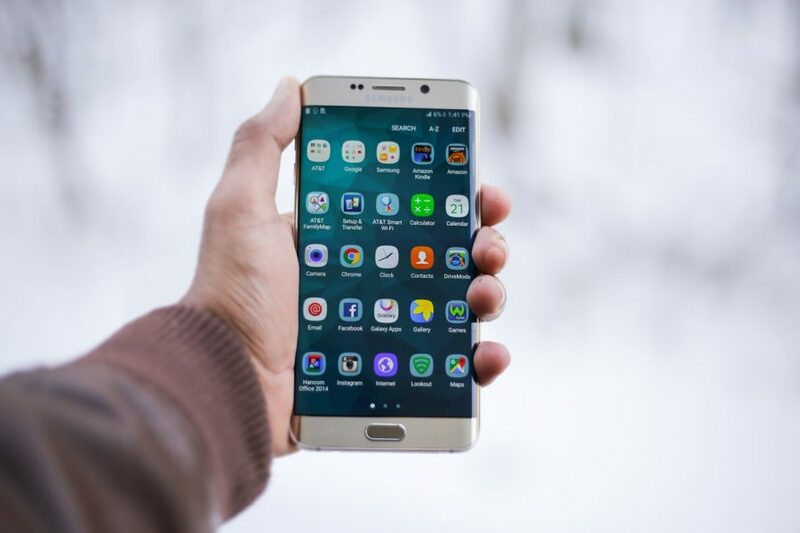 Technology giant, Samsung, is not new to the field, as the South Korean organization previously blew up the cryptosphere by meshing crypto with the launch of the company’s latest flagship device, the Galaxy S10.